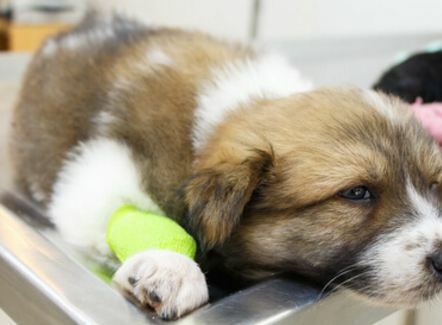 Something to keep in mind is that you will treat the wounds to help your dog have a rapid recovery and also to prevent it from being infected and that this brings some damaging consequences for it. Remember that when you’re cleaning a wound, you better gag it. This preventative measure has nothing to do with confidence: when a dog is afraid or feels threatened, its natural reaction will be growl and even bite. Before you start healing a wound, you must evaluate the gravity of it. If your dog cries, if you perceive significant inflammation, if you can see internal parts, such as tendons, muscles or bones, if there are skin parts or tissue hung, bleeding much or the cut is very deep, you better take it to the vet so that it determines the PR Ocesso you should follow. Scratches or cuts can be easily treated at home, it is best to do so to avoid future problems. The bleeding wounds must have staunched blood before continuing to clean the same. To make proper cleaning in a dog’s wound, it is advisable to cut the hairs around the wound, as they may hinder the process. We recommend using small scissors and be very careful. Doing this will not only allow you to better evaluate the lesion, but it’ll also facilitate healing. Clean the wound with soap and water, preferably with lukewarm water. Try removing any dirt (dust, dirt, by), because this will prevent any types of bacteria from penetrating into your pet’s organism. The hot water will also help calm the dog, which will be extremely helpful for the rest of the healing process. This washing should last at least 2 minutes. If you observe that the wound is causing pain in the dog, however, it is not serious, or if it is inflamed, you can put some ice. Remember to wrap the ice in a cloth to avoid burns and also to prevent ice from sticking to the skin of the animal. After having controlled inflammation, follow with an antiseptic, use iodine to disinfect. Remember that, before use, you should reduce the solution by mixing the same amount of iodine with the same amount of clean water. Then, using the gauze, make a careful compress, avoiding leaving lumps on the dog’s skin. You should repeat this process at least three times a day. Unfortunately, most of those who tend to ruin even more the wounds are the dogs themselves, so it’s important to take care that he doesn’t poke the wound. A great way is to put on your dog an Elizabethan necklace because this will prevent his access to the wound, thereby it will not dampen the wound site, which will help with that it heals normally. Read This Article: Oral Flea Medication for Dogs, Is Good? Previous post Can Snakes Climb Stairs or Wall?